Hammarby IF:s Roddförening (Hammarby IF's Rowing Club), abbreviated Hammarby Rodd (Hammarby Rowing) is a club aiming to attract both the racing and the exercising rower. We are usually one of the three most represented clubs in national regattas, such as the Swedish Championships. You are always welcome in Hammarby Rodd, no matter your level of skill or ambition. During the boating season, the focus is on water training and participation in national regattas. During the winter months we offer alternative training indoors and outdoors for the coming season. Our boating season starts when the ice dissappears, and ends when the ice forms. You can find our current general training schedule here (Swedish). If you are a rower and are interested in rowing with Hammarby Rodd, please contact the Club Captain at . If you don't know how to row and are interested in our beginners course, contact . Hammarby Roddförening was formed April 10th, 1889, and became the foundation of what today is the whole of Hammarby IF, now 16 different sports sections. The name of the association comes from Hammarby Lake where the first boathouse lay. Both the boathouse and the first racing shells were built by the rowers themselves. Hammarby Roddförening is situated just south of Södermalm, on Årstaviken's south shore, just a four minute walk from the Gullmarsplan metro station. Our address is Sundstabacken 12, Stockholm. Come down to the Club to try rowing or training with us. If you like it and want to stay, you pay our members and club fees. All (junior and senior) who are active in Hammarby IF's Rowing Club are also members of the Hammarby IF Alliance and placed under the Rowing Club's list. Pay your members fee to PlusGiro 855436-2 (Hammarby IF). Enter your name, address, personal number (or, if you don't have one, date of birth) and - last but not least - that you should be a member of the Rowing Club! Then, half of the money comes back to the Rowing Club and your name is in our listings! Anyone who uses the facilities of the boathouse like rowing equipment, gym, sauna, and shower, must also pay a training fee. For that, you are allowed to use the rowing equipment, and everything else that the boathouse has to offer. 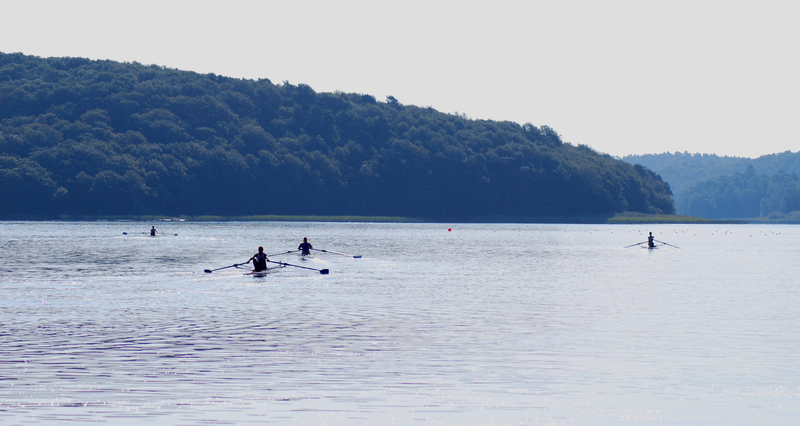 The club additionally purchases a rowing license in the Swedish Rowing Federation, which allows you to compete in national regattas and insures you during training and competition. Enter your name, address, personal number (or, if you don't have one, date of birth) and "Training fee" on the payment made ​​to PlusGiro 193213-6 ( Hammarby IF Roddförening) or IBAN: SE33 9500 0099 6042 0193 2136 (BIC: NDEASESS).